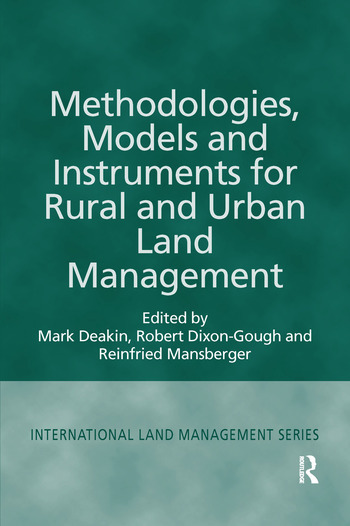 Illustrated with empirical case studies from Europe, Africa and North America, this book provides an overview of the wide range of innovative methodologies, models and instruments currently being applied in the formation of and implementation of land management strategies. It examines techniques such as data acquisition, data modelling, the legal instruments of land management and structural theories and applications ranging from historic land use to current programmes of urban redevelopment. It then shows how these advance land management and development in practice. Contents: Introduction, Mark Deakin, Robert Dixon-Gough and Reinfried Mansberger; Partnership, process, and planning in estuary management: the case of the Lower Thames, Robert Home; Land reform in developing countries: legal and institutional aspects, Alec McEwen; International land management: aspects on education and training, Reinfried Mansberger and Erwin Heine; Land fragmentation in Central Europe: how and whether to use Western experience, Terry van Dijk; The implementation framework of legal systems, Ninel Jasmine Sadjadi; Mediation in land consolidation and in boundary disputes, JÃ¸rn Rognes and Per KÃ¥re Sky; Policy instruments in the changing context of Dutch land development, DaniÃ«lle Groetelaers and Willem Korthals Altes; Modelling the development of sustainable communities in Edinburgh's South East wedge, Mark Deakin; The redevelopment of the railway lands of London's King's Cross: actors, agendas, and processes, Emmanuel Mutale; BEQUEST: sustainable urban development, the framework, and directory of assessment methods, Mark Deakin and Steve Curwell; Object model for temporal changes in geographical information systems, Abdul Adamu, Souhiel Khaddaj and Munir Morad; Using GIS techniques to evaluate community sustainability in open forestlands in sub-Saharan Africa, Yang Li, Alan Grainger, Zoltan Hesley, Ole Hofstad, Prem Lal Sankhayan, Ousmane Diallo and Aku O'Kting'Ati; Community participation in rural and urban development, Robert Dixon-Gough, Reinfried Mansberger and Mark Deakin; Index.